The choice of individual tests is made on the clinical situation. SERUM AMYLASEMEASUREMENT is useful in acute disease but is of no value in chronic disease. SERUM LIPASE is raised in acute pancreatitis. 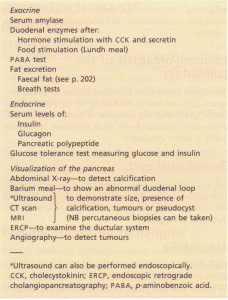 MEASUREMENT OF DUODENAL ENZYMES, either after hormone stimulation or after food, is only sometimes helpful in the diagnosis of chronic pancreatitis because of the large reserve in enzyme capacity. A tube is passed into the duodenum and pancreatic secretions are collected after stimulation. Stimulation with secretin or CCK causes a rise in bicarbonate and enzyme, e.g. trypsin levels, which are low with chronic disease. 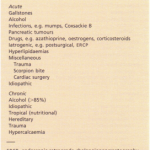 The differential diagnosis between pancreatic tumour and pancreatitis is difficult. These tests have been largely superseded by imaging techniques. The Lundh test is performed in a similar fashion, the stimulation being produced by a meal. Measurement of trypsin and lipase is undertaken. These are low in chronic pancreatitis. The Lundh meal test is particularly useful in the investigation of steatorrhoea. Investigations available for the assessment of pancreatic disease. PABA TEST. N-benzoyl-L-tyrosyl p-aminobenzoic acid is a synthetic peptide hydrolysed by pancreatic chymotrypsin to release free PABA, which is absorbed, metabolized and excreted in the urine. Reduction in absorption of free PABA occurs (after an oral load of the peptide) in pancreatic insufficiency and the test is highly specific in expert hands, although not widely utilized. 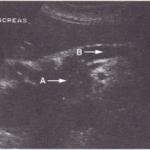 FAECAL FAT ESTIMATION is performed to demonstrate steatorrhoea. A breath test can also be used; here the amount of 14C02 in expired air is measured following oral ingestion of a labelled fatty acid compared with that after a labelled triglyceride (e.g. [14Cloleic acid compared with [14Cltriolein). Impaired triglyceride absorption with normal fatty acid absorption indicates that pancreatic disease is the cause of the steatorrhoea. Assessment of endocrine function is only useful if a hormonesecreting tumour is suspected and the serum measurements are often diagnostic. Plasma PP is raised with all endocrine tumours. The glucose tolerance test is seldom performed as it is affected by so many parameters. This now largely depends on ultrasound examination and CT scan to detect pancreatic size and shape, and the presence of cysts or tumours. An ERCP can be used to outline the pancreatic ducts. MRI with or without dynamic enhancement with contrast is slightly more sensitive than CT. Endoscopic ultrasound is particularly useful in the diagnosis of small endocrine tumours. Arteriography with selective catheterization of the splenic artery shows irregularity and encasement in carcinoma. A combination of two or three tests is often necessary and none of the investigations is diagnostic. Fine-needle aspiration of any abnormality discovered can be performed under ultrasound or CT scan control. The presence of malignant cells in the aspirate indicates tumour but, of course, a negative sample does not exclude malignancy.